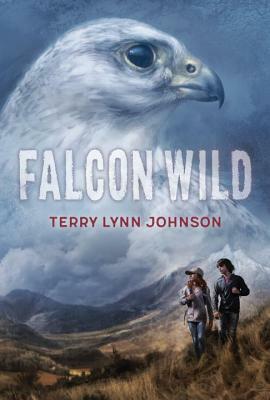 Terry Lynn Johnson is the author of middle grade adventures based on her experiences in the wilds of northern Ontario, Canada, including Ice Dogs, Sled Dog School, and Survivor Diaries, a series for reluctant readers (HMH). She is an award-winning member of the Outdoor Writers of Canada and currently works as a Conservation Officer with the Ontario Ministry of Natural Resources and Forestry. Lost in the Montana wilderness, two white children and a tame gyrfalcon learn to trust one another. Thirteen-year-old home-schooled Karma lives in Montana on her family's bird-of-prey education center, where she helps her white father train raptors. Karma longs to have friends but worries she talks too much about hawks and falcons—her favorite is a rescued white gyrfalcon named Stark. When Stark's owner reclaims her, Karma reluctantly drives with her father and younger brother to deliver her. Shortly after letting off an unfriendly teenage-boy hitichhiker named Cooper, their van blows a tire and crashes. With her father and brother injured and Stark escaped, Karma sets out to find help. After she falls into a crevice, she is rescued by the mysterious Cooper, who spotted her thanks to the white bird circling overhead. Overjoyed to find Stark, Karma continues her search for help. As she and Cooper hike into the wilderness, they endure a slew of unfortunate events that would make Lemony Snicket proud (grizzly, near-drowning, falling, infection, thunderstorm/hail), and Cooper gradually reveals his past. Karma's simple present-tense, first-person narration is inconsistent in her worry for her father and brother, and interesting information on falconry and raptors is imparted in an academic style that lacks smooth integration into the story. The components are there; the cohesion is not.